Mitt bland gyllengula rapsfält står hon, rakryggad och utan att be om ursäkt. Hon rör sig genom olika natursköna landskap, in mot stadsmiljö och de vita omgivningarna. Hon pratar inte med någon, ingen pratar med henne, precis som den svenska kolonialismen är hennes närvaro ett outtalat ämne. Lhola Amira was born in 1984 in Gugulethu, South Africa; she currently lives and works in Cape Town. The artist Lhola Amira was borne from the body of curator and academic Khanyisile Mbongwa, both Womxm share a plural existence, co-habiting the same body. In essence, Lhola Amira highlights new manifestations of inequality. Her practice speaks of the survival of Black individuals, in particular Black Womxn, in a world dominated by white women and white men. Khanyisile Mbongwa is a founding member of both, the artist collective Gugulective and Vasiki Creative Citizens. 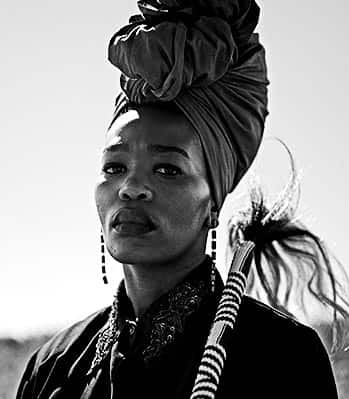 She is currently completing an Inter-disciplinary Masters Degree in Performance Art, Public Art and Public Spheres at the University of Cape Town in affiliation with the Institute of Creative Arts (ICA). Lhola Amira was awarded the AiRS (Artist in Residence Skövde Art Museum) residency in Skövde, in 2017. Earlier residencies include participation at the Jiwar Creation and Society in Barcelona, Spain in 2015, and at Vasl Artists’ Collective in Islamabad, Pakistan in 2010. Lhola Amira has made numerous solo appearances both locally and abroad. In 2017 the artist presented her solo show at SMAC Gallery in Stellenbosch titled Looking for Ghana & The Red Suitcase as well as LAGOM: Breaking Bread with The Self-Righteous at SMAC Gallery in Cape Town. In dddition, Lhola Amira made three appearances in Bloemfontein, South Africa, entitled 29 ? 06’S 26 ? 13’E as part of her most recent project. Lhola Amira’s work forms part numerous public and private collections such as: The Zeitz Museum of Contemporary Art Africa (MOCAA), in Cape Town, South Africa; the Robert & Reneé Drake Collection, in Wassenaar, Netherlands; Skövde Konstshall, in Skövde Sweden; the Tiroche DeLeon Collection, Gibraltar; and the Iziko South African National Gallery, in Cape Town, South Africa. Sweden has successfully cultivated a neutral imagery; its footprints around colonialism and slavery seem non-existent, buried. Yet Sweden was the first country to colonise Ghana, and was active as colonisers on the island St. Bartholomew from 1784 to 1878. With profits made from selling 'unclaimed slaves' contributing to the Swedish crown. LAGOM, investigates the kinds of benefits that colonialism afforded a country like Sweden.